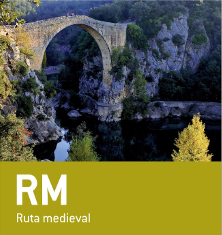 Besalú’s medieval bridge is one of the most esteemed monuments in the county of La Garrotxa. Although documented from the eleventh century, some historians believe that its original structure was very different from the bridge we see today. It is thought to have been destroyed by floods in 1315 and then rebuilt using taxes imposed by King Jaume II. It is 105 m in length and stands 30 m in height, tower included. Its seven arches are arranged in a dogleg due to the position of the rocks in the river on which it stands. In 1385 a tollgate in the main tower was added on. However, by 1881 the bridge no longer had either a central tower or an entrance gate; worse still, it was blown up during the Spanish Civil War. In the 1950–1960s it was rebuilt by the General Directorate of Architecture.